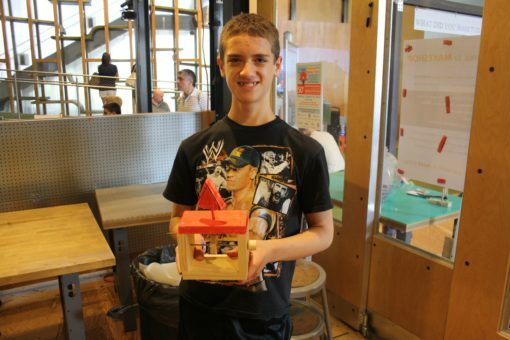 Recently, I had the opportunity to teach a workshop called “Wooden Automata”, in which kids created kinetic wood projects. When I started planning my workshop, I immediately knew I wanted to do something with wood, since it’s my favorite material to work with. I realized that for a lot of kids, wood is seen as purely static, and the thought of making something that moves may not occur to them! I wanted to demonstrate some of the possibilities for wood, so I created a kit to make an open-sided box with a camshaft (a rotating rod) in the middle. While the box parts and handle for the creations were pre-cut (yet still requiring assembly), the type of cam (gear) participants could create, and the object that would move as a result of the cam’s rotation was entirely up to them. Four kids came to the workshop: a trio of brothers, ages nine, ten and thirteen, and a thirteen year old girl. 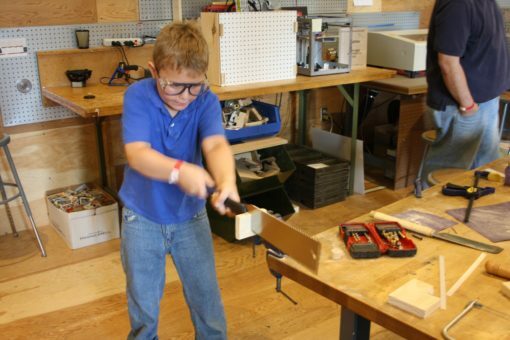 They used drills, saws, sandpaper and various other woodworking tools to make their boxes, differently shaped cams, and moving objects. 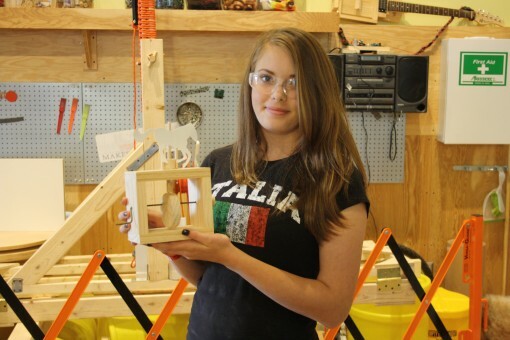 They ended up making some very cool, unique, fully functional projects, and I really enjoyed working with them.